Romayne Charles with her award after being crowned the best secondary school teacher in the country. 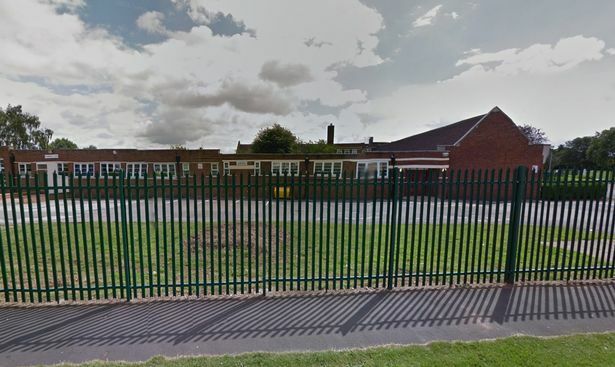 Nuneaton officially plays home one of Britain’s Classroom Heroes. But golden girl Romayne Charles is humble about her achievements, saying it is an award she both shares and dedicates to her colleagues and students at Higham Lane School. She knew about the award last week but had to keep it a secret from her family, who erupted with emotion when her name was called out during a glittery ceremony in London last night (Sunday, October 21). 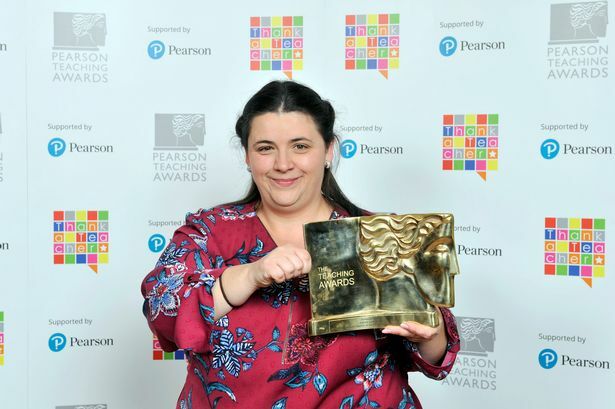 “I found out on Tuesday, the BBC had come into school filming, I just thought they were filming all of the silver awards winners, then Carol Decker walked into the classroom and said ‘ you have won the gold teaching award’,” the Stockingford resident explained. She took her dad Andrew and one of her brothers, Richard, down to London for the award ceremony but had to keep her achievement a secret. “It was so difficult not tell my family, they came round before I left say and were saying ‘if you don’t win, you are still a winner in our eyes’ and I was desperate to tell them but I couldn’t,” Miss Charles said. The moment when her name was read out came as a huge surprise to her dad and brother. She has spent the day in London today, being interviewed by the country’s media but she is due back in the classroom at the Shanklin Drive-based school tomorrow (Tuesday, October 23). “I can’t wait to see the students, a lot of them have been saying to me ‘Miss, have you won yet?’ they are going to be so excited,” she said. Miss Charles has been teacher for eleven years, starting off at Nicholas Chamberlaine in Bedworth before moving to Higham Lane eight years ago. She teaches sociology, religious studies and health and social care, and is also the subject leader for modern ethics and social science. It was an anonymous nomination to the headteacher, Phil Kelly, who then endorsed the nomination and completed the form before sending it off to the Pearson Teaching Awards. “It was so beautiful, really it was,” Miss Charles said. Her inspirational work in and out of the classroom led to the award but Miss Charles says that her own inspiration came from teachers who went above and beyond for her. She said: “I remember I had some brilliant teachers at Alderman Smith, they went above and beyond for me, Miss Crampion and Kirsty Robinson, and I remember thinking ‘I want to be like them'”. Phil Kelly, headteacher at Higham Lane School and sixth form, was at the awards ceremony. “He is just so proud, he has been so supportive, even before the nomination, he said some fabulous words,” Miss Charles said. Mr Kelly himself was keen to praise his ‘one in a million’ teacher, saying: “She is so modest and unassuming and is a team player but she is also an enthusiastic, inspiring teacher who has the highest expectations and engages warmly with staff, students and parents. Now in their 20th year, the Pearson Teaching Awards, which were set-up by Lord Puttnam CBE, celebrate outstanding teachers and teaching across the UK. Hosted by BBC presenters Anita Rani and Sean Fletcher, the annual ceremony will be broadcast on BBC2 on Sunday, October 28th October at 6pm as ‘Britain’s Classroom Heroes’.